OMNITHRUSTER DOES IT ALL! • Thrusts with nozzles out of water in rough seas : vertical systems only. • No protrusions ... no change in hull shape. » Small nozzles reduce drag . .. save fuel and passage time. » Easily retrofitted. Modular Thruster System may be electric, hydraulic or diesel powered in conjunction with manual/automatic or integrated control networks. MODULE THRUSTER •Covered by U S Patents. Industries, Inc., New York, N.Y., for a Title XI guarantee to aid in financing a twin-screw ocean- going tug and a bulk oil barge. XI program. However, the amount of the guarantee in this case has been set at $4 million at Mor- ania's request. 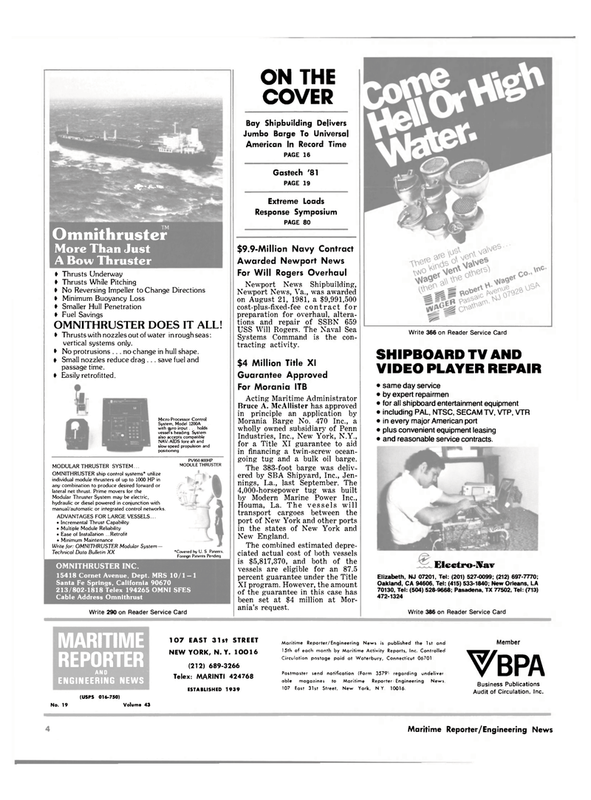 VIDEO PLAYER REPAIR • same day service • by expert repairmen • for all shipboard entertainment equipment • including PAL, NTSC, SECAM TV, VTP, VTR • in every major American port • plus convenient equipment leasing • and reasonable service contracts. Postmaster send notification (Form 3579' regarding undeliver able magazines to Maritime Reporter Engineering News. 107 East 31st Street, New York, NY. 10016.